The Department of Transport has confirmed that the safety and rights of commuters remains one of the Department of Transport’s main priorities. The Government has through the voice of the Minister of Transport expressed the objective to renew public transport fleets such as trains, buses, and taxis and to make sure that our commuter rights; comfort, safety and dignity are respected in all spheres of transport services. Unfortunately we find media releases every day of taxi passengers flung from deteriorating and non road worthy vehicles. These unfortunate individuals seldom have a variety of choice between vehicles and are inclined to jump on the first available vehicle. The Arrive Alive Road Safety website has decided to compile a summary on the safety of commuters on the roads of South Africa and to reveal the strategy of government to address the challenges facing commuters and transport operators. What are the rights of these commuters? Transport services that provide value for money. What should be expected from public transport operators and their passengers? Transport operators at all levels should maximise efforts to improve safety. Good road behaviour should include stopping at traffic signs, safe speed, safer following distance and not driving under the influence of alcohol. Taxi operators and bus operators must respect the rights of the passengers they transport from one place to another and commuters should be treated as contributors to social and economic development. Operators must ensure that their vehicles are driven by drivers who are medically fit to drive public passengers and are in possession of valid professional driving permits at all times. 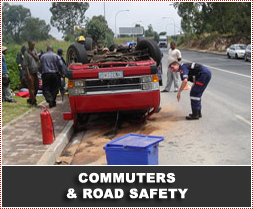 Drivers MUST pay attention to passenger safety, rights and respect passengers. Drivers must listen carefully to passenger complaints, identify problem areas and if appropriate take action to remedy the situation. It is the responsibility of operators to display the public transport charter in all public transport vehicles in a position clearly visible to passengers and to display telephone numbers or addresses on vehicles where complaints should be directed. It is also the responsibility of operators to prohibit drivers from harassing, intimidating or molesting passengers and to take action against drivers who do so. Passengers have the responsibility to make sure that vehicles stop before boarding or alighting, pay the valid fare for the trip and show tickets for inspection when required. Commuters have the right to ask the driver not to exceed the number of passengers permitted to be carried in the vehicle or board a vehicle, which is overloaded. The Department of Transport has urged passengers, drivers and transport operators to treat each other with respect and dignity to achieve the goals of sustainable, affordable and reliable transport services. The need for greater safety of commuters will become even more of a priority as we approach the 2010 World Cup. The Department of Transport has expressed the concern that if the relationship between transport operators, commuters and divers is not amicable we risk the danger of failing to accommodate and transport comfortably our visitors for this prestigious event. The Minister of Transport has expressed the belief that Transport Authorities ought to be able to overcome these challenges and that South Africa will manage the more than 350 000 spectators that will participate and watch the 2010 Soccer World Cup. Transport operators have been urged and encouraged to conduct their businesses with due care for the safety and security of the public and to ensure that the working conditions for their employees are in line with labour legislation. Operators have the right to be paid the valid fare in full by all passengers, adequate, clean, secure and well managed public transport facilities, including stops, ranks and termini. They also have the right to adequate road infrastructure that is managed in such a way as to allow for safe and cost-effective public transport operations and traffic management that ensures that public transport services can operate effectively. Regulatory and administrative processes that are efficient and effective for example operating licence applications and permit conversions and assistance in educating drivers and passengers on their rights and responsibilities are key in addressing challenges that affect the rights of all parties. Cabinet approved the Public Transport Strategy and Action Plan in 2007. The strategy aims to radically accelerate the improvement in public transport by focusing on modal upgrading and establishment of Integrated Rapid Public Transport Networks, which will include Priority Rail Corridors, and Bus Rapid Transit networks in our cities. The strategy is supported by the Public Transport Action Plan, which focuses on the implementation of the strategy and sets out implementation in a phased and incremental manner. Government has accepted the responsibility to ensure that commuter and operators’ rights are respected. In accepting this responsibility government has pledged to work earnestly to maintain the networks that will require city-wide, transport authority controlled networks of rapid public transport corridors together with feeder systems of smaller buses, taxis, bicycles, pedestrian access as well as metered taxis and park and ride facilities.